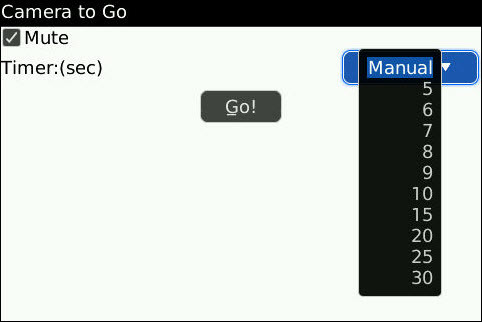 CameraToGo is a neat little application that adds great function to your BlackBerry. A lot of people always ask if it's possible to mute your shutter noise on your camera. Well yes, there are many applications out there that allow you to do so, none of which add a timer that allows you to set up a timed interval for your device to takes pics though like CameraToGo does. So maybe you want to get a group photo of the crazy pub crawl you went on or maybe you are just on a family outting and just need a quick picture to upload to Twitter or Flickr and are not really feeling like asking a passerby to snap a pic. CamaraToGo could come in handy in these cases where you can set up your shot, set the timer and step back and be in the photo yourself. A free trial is available in the CrackBerry App Store and CameraToGo sells for only $4.99. Check it out, you may just need it sometime. Please note though-- CDMA devices do not have the ability to suppress shutter noise.